Sometimes children with Autism are non-verbal. When a child is non-verbal they need other forms of communication so that they can communicate with the world around them. One of the Assistive Technologies available to them is Proloquo2Go. Proloquo2Go allows children who are nonverbal who speak both English and/or Spanish to communicate to the people and the world around them. It allows the user to choose a vocabulary level, language, and grid sizes for the buttons on the screen. Other supports available in the app are language development, literacy, classroom, therapy, voices, and accessibility. 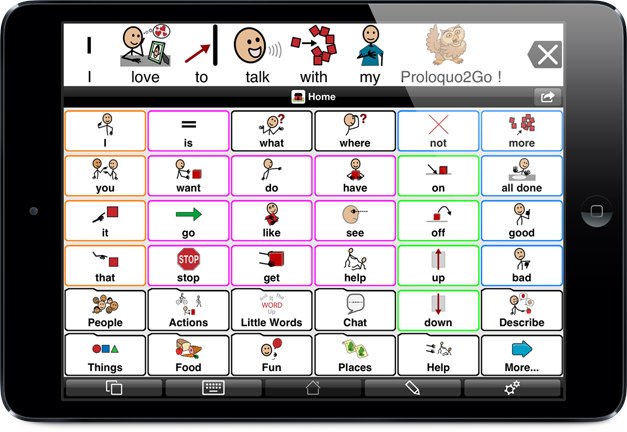 I chose proloquo2go because I was interested in Assistive technology for children with Autism who are non-verbal. Proloquo2go is a communication app in both English and Spanish, and it helps not only people who are just starting out with communication, but also older children as well. The website provided gives highlighted information on the app itself, and how it supports its users. It lists the latest improvements to the app, and explains where you can get the app. It is a bit pricey, but sounds like it is worth the cost. The website also offers video of real life use of proloquo2go.